History: The scientific name is Cyanococcus, which falls under the Genus Vaccinium (cranberries fall within this genus as well). They grow on a bush which can be less than a foot in height (4 inches) to 13 feet tall. The smaller bushes are known as “lowbush blueberries” or “wild” whereas the taller bushes are known as “highbush blueberries.” They are native to North America. The flowers are white, pale pink, red, or even with a hint of green and form the shape of a mini school bell. Blueberries were introduced to Europe in the 1930s. We rarely refer to blueberries in the singular, blueberry. That’s because the normal consumer eats them in bunches, either popping a few in their mouth or eating one at a time. I don’t recall a time when I only ate one blueberry. However, at Wholefoods, I was fortunate enough to each individual blueberry. Rarely do markets sell individually as shown below; rather they’re sold in 4oz, 6oz, 12oz, or 16oz containers. A majority of the blueberries were decent size. Size does not matter when it comes to eating blueberries. Depends on your preference. However, I wanted to show you the quality of what was presented in front of me. Below in the middle is a normal sized blueberry, and on its left and right were the sizes that I chose. 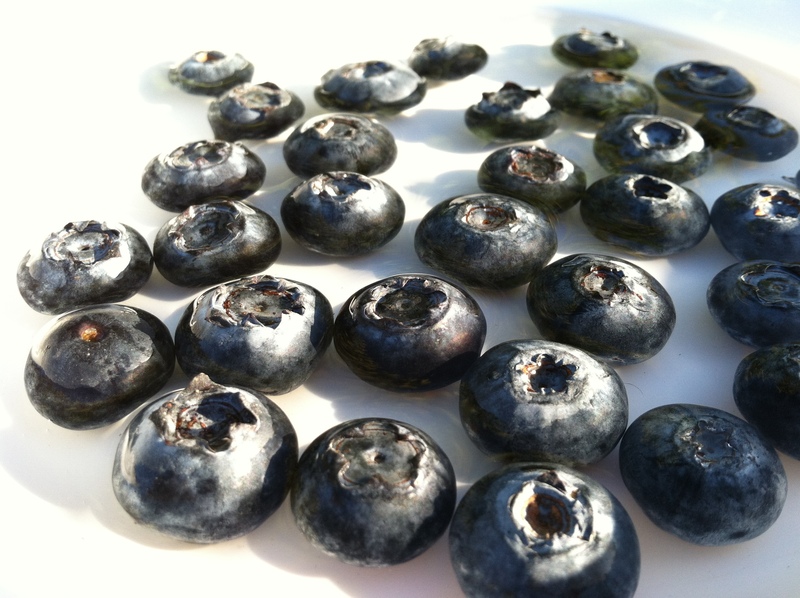 The size of a blueberry varies, ranging from 5 to16 millimeters in diameter. Picking/Choosing (colors): Blueberries, ripen in this color order: green, red-purple, dark blue (indigo). So, if you are staring at blueberries below, do not choose the two purple ones unless you like eating your blueberries sour. Picking/Choosing (bulb openings): Asides from the obvious colors, a secret is looking at the bulb opening on top. This is the bulb of the flower that was once opened and closed as the fruit formed. Take a look at the photo above. Notice how the blueberry in between the 2 red/purple ones has a semi closed opening. You want to choose the ones that have fully opened. Those tend to be sweeter. Take a look at the photo below. 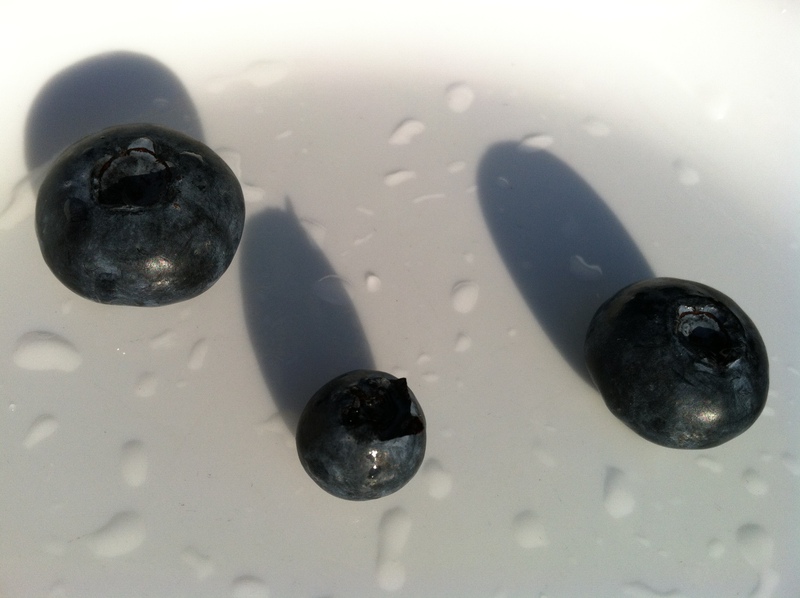 Below are all the blueberries that were handpicked by me, presented in water for another dimension and perspective. Texture: Depending on the blueberry you ate, the perfectly ripened one should provide some resistance upon chewing. Upon first bite, your teeth will puncture the thin layer of skin, then you reach the core of the berry. Overly ripe blueberries will be mushy, meaning all it takes is one bite to flatten the fruit in your mouth. The perfectly ripe one will take 2 bites. 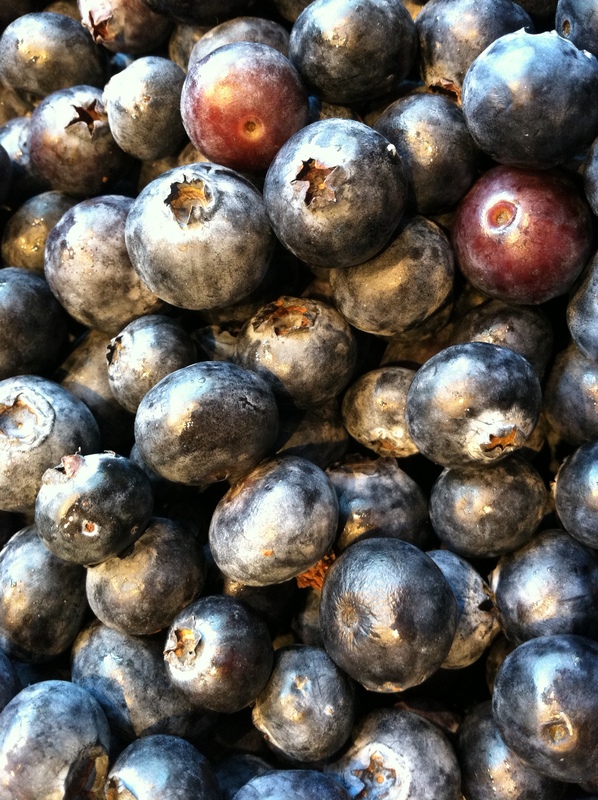 Taste: Blueberry skin are similar to grapes in the sense that it provides some acidity. There is also the tiniest bit of astringency, which is the drying of the mouth; imagine puckering of your mouth/lips. The more sour it is, the more astringent that blueberry is. The core of the fruit, assuming you chose a ripe one, is sweet. Close your eyes. As you bite into the fruit, your tongue picks up hints of sourness. Once the skin has been punctured, your taste buds pick up the sweetness of the fruit. The softness of the core mixes in nicely with the tangible harder outer layer. 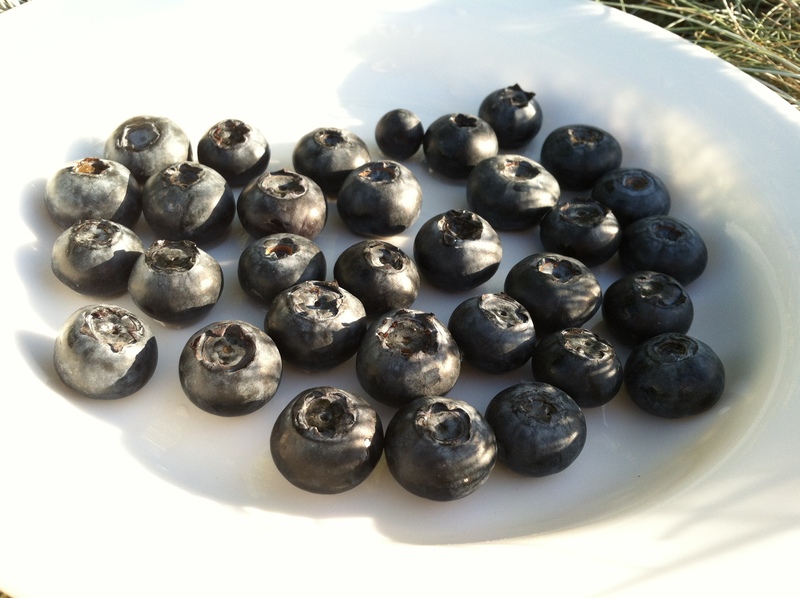 The next post will be about a new way to eat blueberries. Stay tuned! “cyanococcus”?? If you got this from Wikipedia or something, then yes, it does say that this is the section name for the blueberry…except “section” is a pretty obscure classification, partway between genus and species; no one ever uses it except specialists, I would guess. 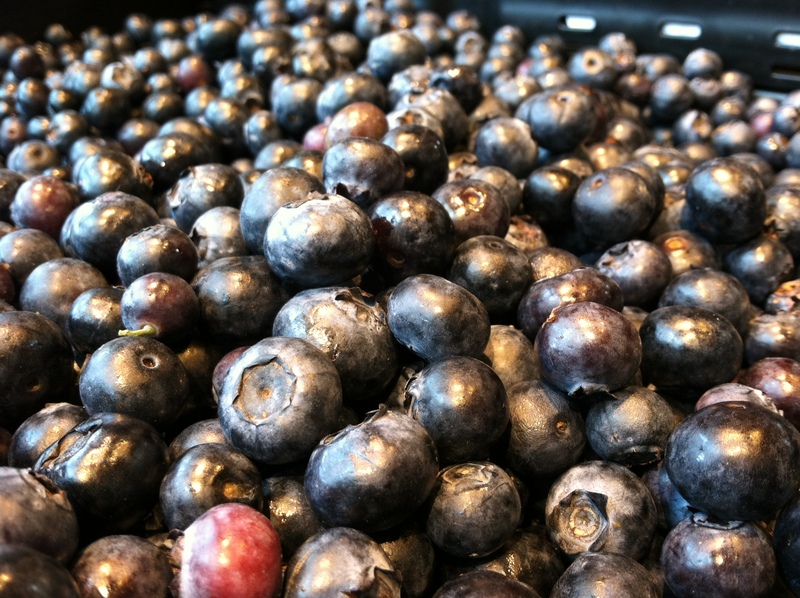 Commercial blueberries are typically hybrids or selected varieties of Vaccinium corymbosum, sometimes V. angustifolium, or others, depending on regional growing conditions.